Dorothy Adelaide Rebescher was born on September 15, 1905, and baptized on September 17, 1905, at Saint Boniface R.C. Church, 124 Locust Street, Buffalo, New York. Dorothy worked as a telephone operator. She married Vincent J. Reeb, born April 21, 1900. The couple had no children. 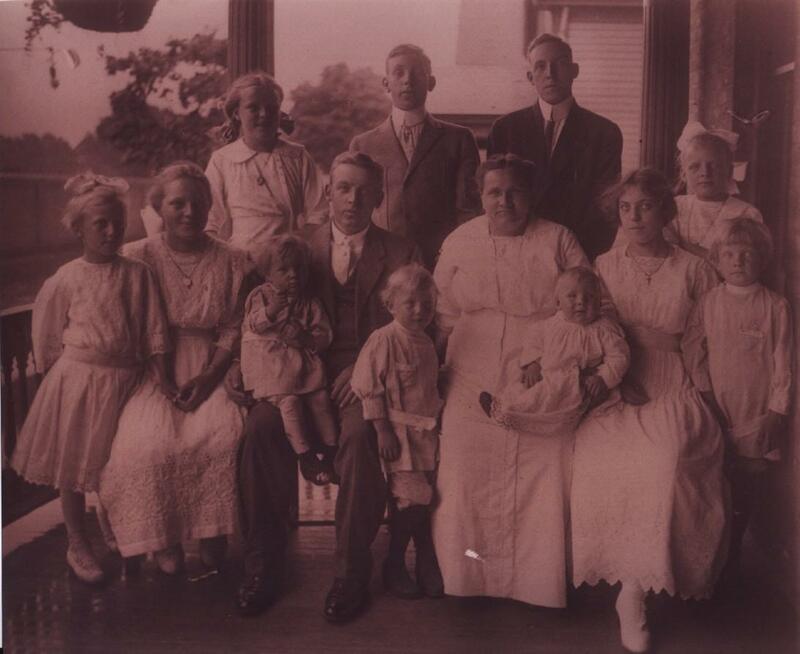 According to family records provided by Geri Ellerbrock, Rose was invited to become church organist of the newly-constructed Infant of Prague R.C. Church (this church building was constructed by her father's construction company). She was organist there for over 25 years. Rose was very creative and talented in crafts, and her items were enjoyed by many. Vincent worked as a bus driver for the I.R.C. (a company that had buses, street cars, and trolleys) from 1943 to 1948. He either retired or changed jobs, as he went to the Infant of Prague R.C. Church as its custodian. Rose and Vincent were known as dear and loving people, who gave freely to all. When Rose's brother, Eugene became ill, Rose and Vincent helped to take care of his daughter Judy. Vincent died at the age of 80 on July 31, 1980. Dorothy died at the age of 77 on October 19, 1982. 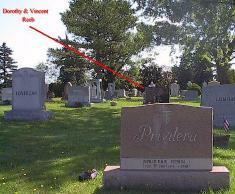 Vincent and Dorothy are interred in Lot 5, Sec. F, Mount Calvary Cemetery (Pine Hill), Cheektowaga, NY. General location of gravesites for Dorothy (née Rebescher) and Vincent Reeb, Lot 5, Sec. F, Mount Calvary Cemetery (Pine Hill), Cheektowaga, NY. A map to the gravesites is available here. 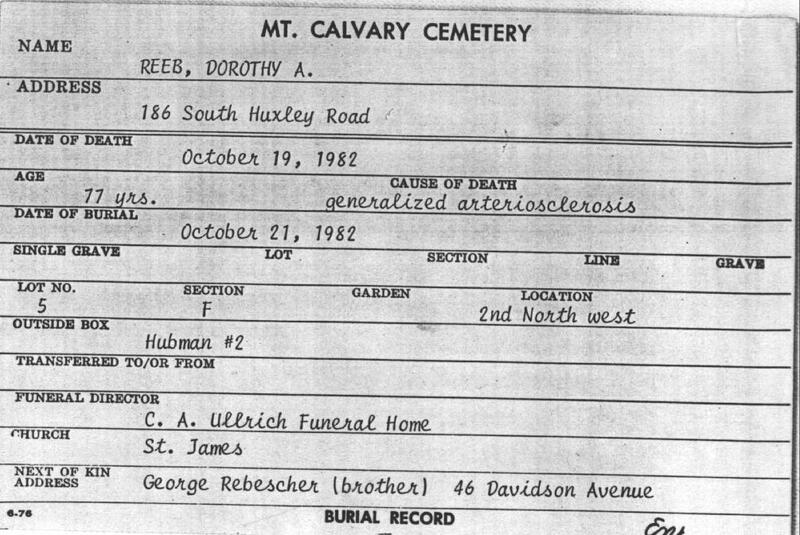 Grave of Dorothy (née Rebescher) Reeb, Lot 5, Sec. F, Mount Calvary Cemetery (Pine Hill), Cheektowaga, NY. 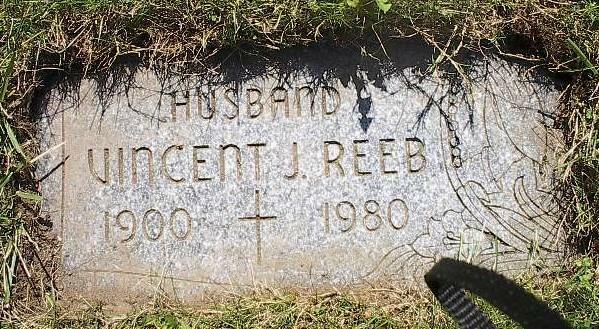 Grave of Vincent J. Reeb, Lot 5, Sec. 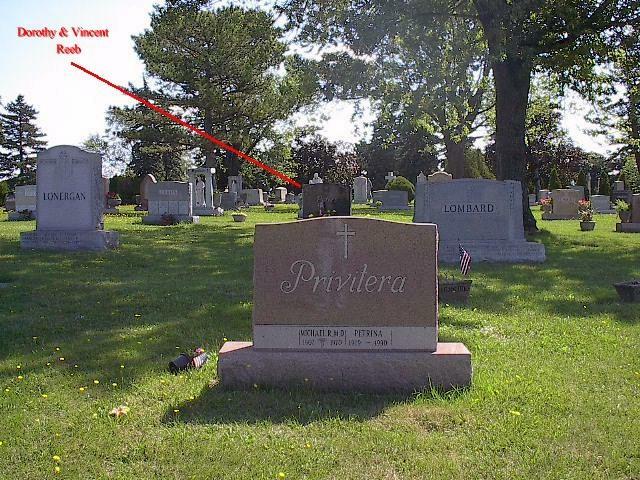 F, Mount Calvary Cemetery (Pine Hill), Cheektowaga, NY. 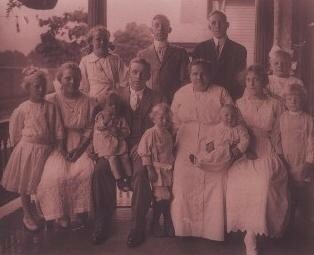 Baptismal Record: Dorothy Adelaide Rebeschki, born September 15, 1905, baptized September 17, 1905. Godparents: George and Catherine Dengler. 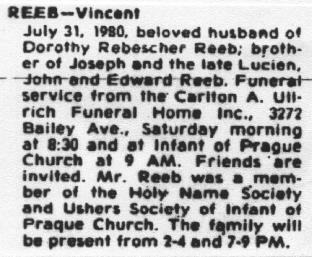 Obituary: Vincent J. Reeb, died July 31, 1980. 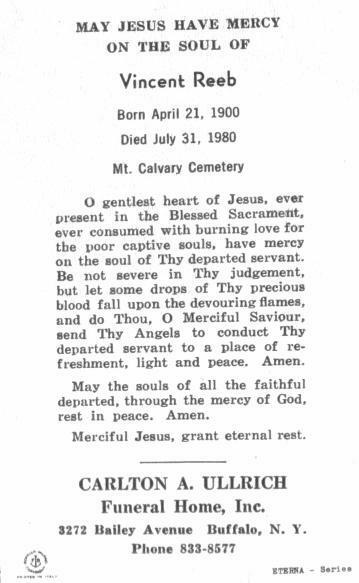 Funeral Mass Card: Vincent J. Reeb; born April 21, 1900, died July 31, 1980. Interment at Mount Calvary Cemetery (Pine Hill), Cheektowaga, NY. 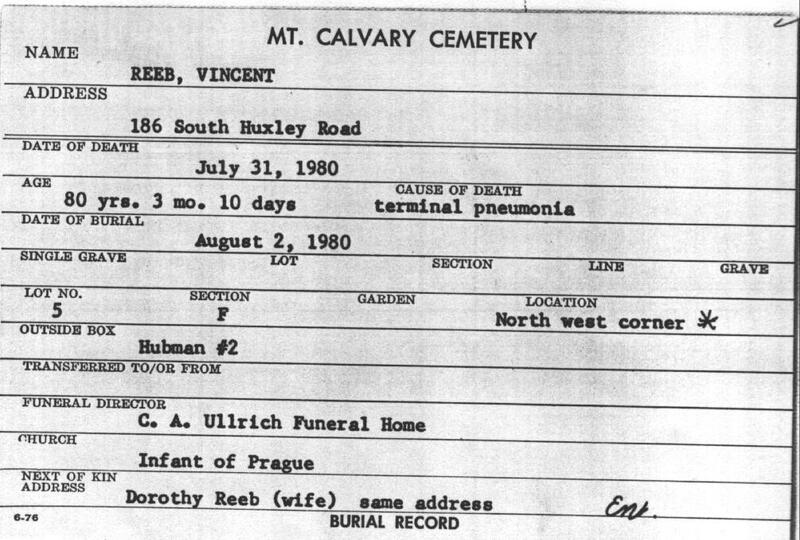 Interment Record: Vincent J. Reeb, Lot 5, Sec. F, Mount Calvary Cemetery (Pine Hill), Cheektowaga, NY. 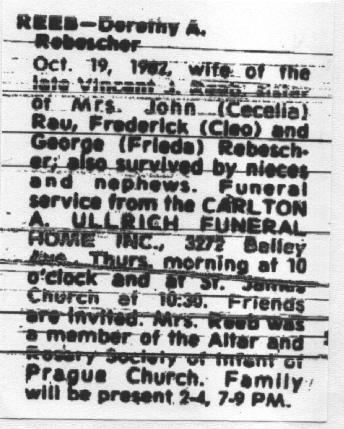 Obituary: Dorothy (née Rebescher) Reeb, died October 19, 1982. 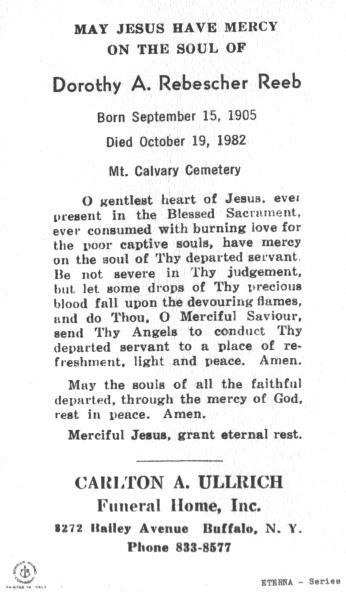 Funeral Mass Card: Dorothy A. (née Rebescher) Reeb; born September 15, 1905, died October 19, 1982. Interment at Mount Calvary Cemetery (Pine Hill), Cheektowaga, NY. 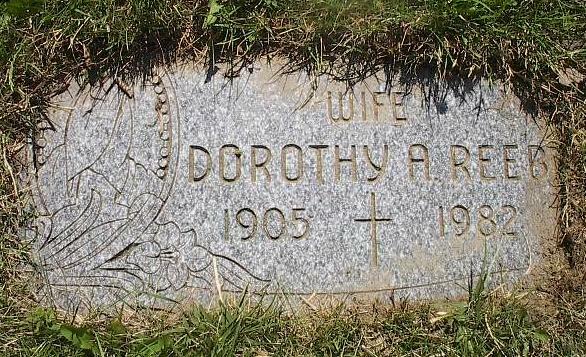 Interment Record: Dorothy A. (née Rebescher) Reeb, Lot 5, Sec. F, Mount Calvary Cemetery (Pine Hill), Cheektowaga, NY. 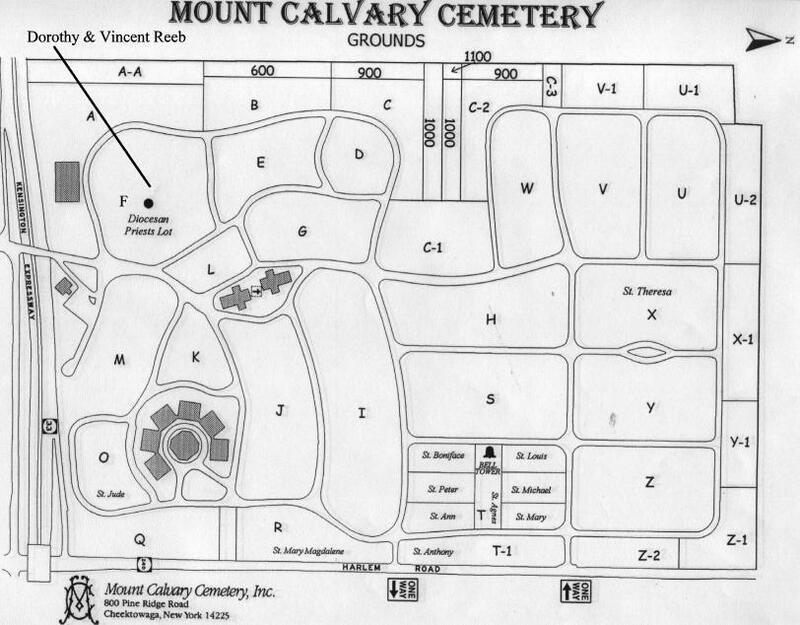 Cemetery Plot Map: Map for locating gravesites of Dorothy A. (née Rebescher) and Vincent Reeb, Lot 5, Sec. F, Mount Calvary Cemetery (Pine Hill), Cheektowaga, NY.